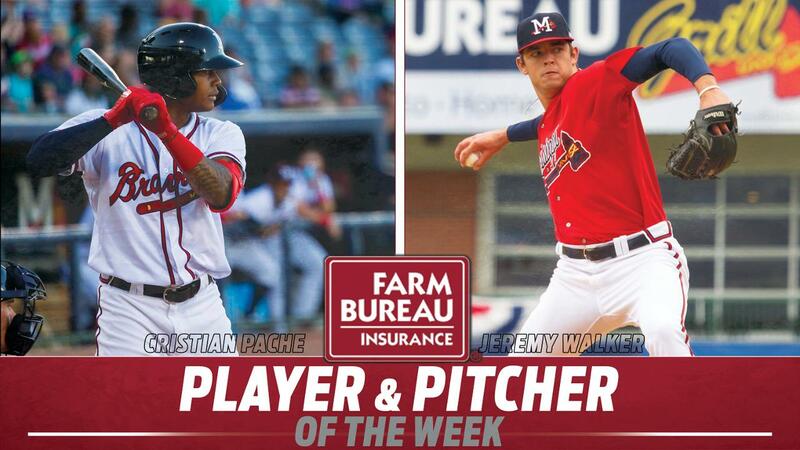 CHATTANOOGA, TN - The Mississippi Braves and Farm Bureau are pleased to announce that outfielder Cristian Pache has been named the clubs Player of the Week, while right-handed pitcher Jeremy Walker has been tabbed as Pitcher of the Week. The awards recognize these players' performances for games during the week of April 4-14. Pache, 20, the Atlanta Braves top position player prospect and No. 32 prospect in all of baseball according to MLB.com hit .313 (10-for-32) over the first eight games of the season and led the M-Braves with two triples, three doubles, seven RBI and four stolen bases. Pache is tied for the team lead in hits with 10. Pache is currently on a five-game hitting streak, batting .412 (7-for-17) with four extra-base hits, six RBI and three runs scored. Pache is currently tied for the league lead in doubles, triples and stolen bases, despite playing two fewer games than most Southern League players. Pache made noise during MLB camp, batting .359 (14-for-39) with five doubles, two home runs, 10 RBI and two walks in 24 big league spring training games His two home runs came in back-to-back games on March 8 and March 9 vs. Philadelphia and Detroit. Walker, 23, has appeared in two games this season and allowed just two earned runs on nine hits over 10.1 innings with 10 strikeouts and no walks. Despite suffering the loss on Sunday in game two of the doubleheader, the Advance, NC native has a 1.71 ERA and 0.87 WHIP pitching in a tandem with starting pitcher Patrick Weigel . Walker is the only M-Braves pitcher to log 5.0 innings in an outing this season and has done so twice. He leads the club in innings pitched and WHIP. The Gardner Webb product was the Braves' fifth-round pick (139th overall) in 2016. Last season he combined to go 6-11 with a 3.84 ERA (61 ER/143.0 IP) in 26 starts between High-A Florida and Triple-A Gwinnett. Walker paced all Braves farmhands with 143.0 innings pitched. The M-Braves hit the road again for a five-game series at Chattanooga beginning tonight at AT&T Field. LHP Joey Wentz will make the start for Mississippi against RHP Jordan Johnson for Chattanooga. First pitch is set for 6:15 pm CT with coverage beginning at 6:00 pm on 103.9 FM and the TuneIn Radio app. The M-Braves will return to Trustmark Park for a five-game homestand, April 20-24 against the Montgomery Biscuits. For tickets visit mississippibraves.com/tickets or call 888-BRAVES4!